The marketing team at Pier 1 Imports chose a challenging time to launch a new campaign. Bank of America had just gobbled up Merrill Lynch, several of the nation’s largest investment firms had buckled down and were receiving TARP money, and in the midst of it all, panic-stricken consumers just weren’t buying. The “test” in question referred to a series of online search ads, developed in conjunction with Google, to drive store sales in select markets. From Sept. 21 to Oct. 11, Pier 1—which advertises mainly via cable buys, newspaper inserts and direct mail—beefed up search terms for its imported furnishings line. It also ran ads on Google’s content network, where, for instance, a consumer reading an article on home design in a test market would see a relevant ad show up. The ads ran in 59 test markets, while 93 others served as control markets, said John McAteer, Google’s retail director. 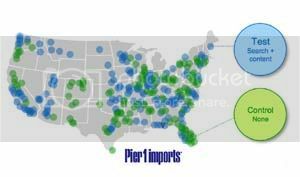 Pier 1 also tapped Internet marketing services firm Resolution Media to identify key markets for the test, as well as Applied Predictive Technologies, a firm that measures the effectiveness of companies’ marketing mixes. In markets where stores were operating on a “performing” basis, the retailer experienced a 2 percent sales lift and a 300 percent return on advertising spend. In other words, that’s a $3 return on investment for every dollar spent on search advertising, McAteer said. In areas where Pier 1’s same store sales were declining, the retailer experienced a 5.3 percent lift. But some of that growth, according to McAteer, may stem from a younger consumer demographic, as well as the fact that newsstand sales were likely down or flat. These stats, however, are all “hypotheses,” he said, adding that Google is looking into the specifics.